Sydney’s world famous Bondi beach has become the spiritual home of boutique development in Sydney as buyers rush to take advantage of the beachside life while developers look to maximise every spare piece of earth. Amari Bondi is the latest project looking to capitalise on Sydney-siders fascination with the iconic beach. The nine-storey project on 38 Ocean Street includes 15 one-bedroom and 15 two-bedroom apartments as well as an opulent 3-bedroom, 2-bathroom penthouse. Eminently liveable, these apartments are set to add even more style and character to this coastal icon. Amari has been specifically designed to completely capture the full Northern aspect, with most apartments also including a glimpse of the ocean. 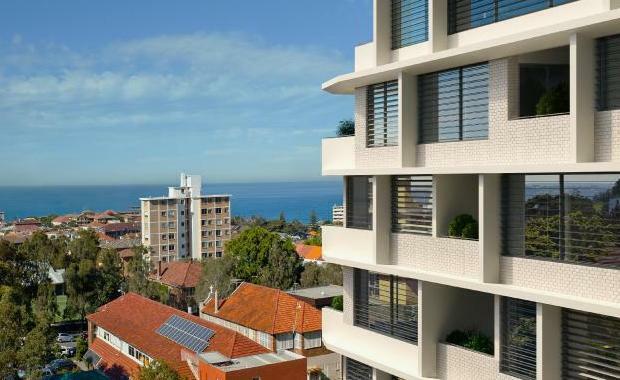 The project is being developed by Napoleon Perdis' Piper Property, who have just come off the successful development of the The Lincoln and Ourania residential apartments in the eastern suburbs. Piper aims to create projects that reflect clean, modern design with a strong focus on lifestyle destinations. The one-bedroom apartments at Amari start at $735,000 without parking and $975,000 with a parking space while the penthouse is priced at $2.25 million. The two-bedroom offerings come in the form of courtyard terraces with 168sq m worth of space, or upper level apartments with ocean views and start at $1.595 million. The sales display suite is currently open Thursday to Sunday from 10am-1pm or by appointment, or Piper Property Group can be reached on 1300 640 090. Bondi’s unit market has been a hive of activity over the past 12 months with CoreLogic RP Data figures showing 160 properties have changed hands. The suburb’s median unit price now sits at $900,000 after growth of 13.9 per cent year on year, and an incredible 38.5 per cent growth since this time in 2013. Most of the apartments will have glimpses of the ocean. Units represent a greater opportunity for buying value, with Bondi houses returning a median price of $2.055 million, more than twice the price of apartments. Bondi houses have grown by 14 per cent over 12 months and 46.8 per cent over three years.